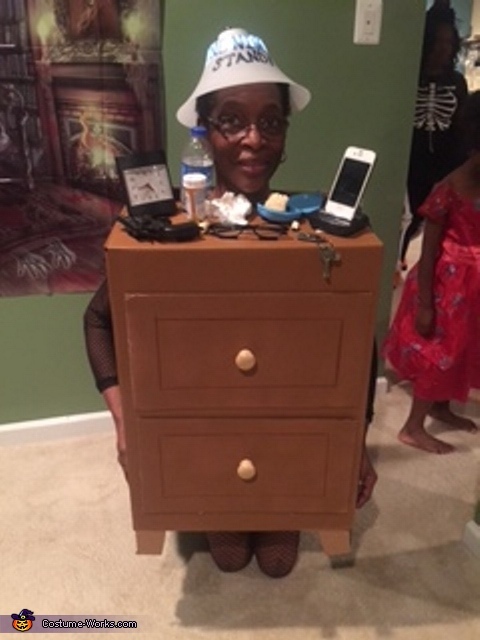 I am wearing a home made night stand . Made from a cardboard box. I cut the bottom out, sprayed painted the box and used two of the bottom cut off flaps for drawer fronts adding knobs. Collecting items usually keep on a nightstand, I glued them on (cell phone keys, alarm clock, medicine, water, gun for protection in the night,and tissue to the top of the nightstand. I used a lamp shade for my head and put a push light in it for the light bulb to turn on. Also a pull chain to turn it on. For the phone charger and lamp I attached a cord and charger cord ra it to the back where I had a outlet socket attached and plugged them in.